It was only a matter of time before TMC started investing a little more into their AquaGro range and they’re consistently producing excellent products that will inspire you and make your life a little easier when maintaining a planted aquarium. These tools are made of the highest quality stainless steel and they are really comfortable in your hand. Easy to operate with a long reach (approx 11″) these tools allow for quick planting and easy trimming of even the thickest stems. You can see the other tools of the trade here. All are packaged nicely so would make a great present or just a treat to yourself. Twitter – why not follow us? Now we just need to find you guys out there who are too. Let us know and we’ll follow you. Click on the button below to follow us. 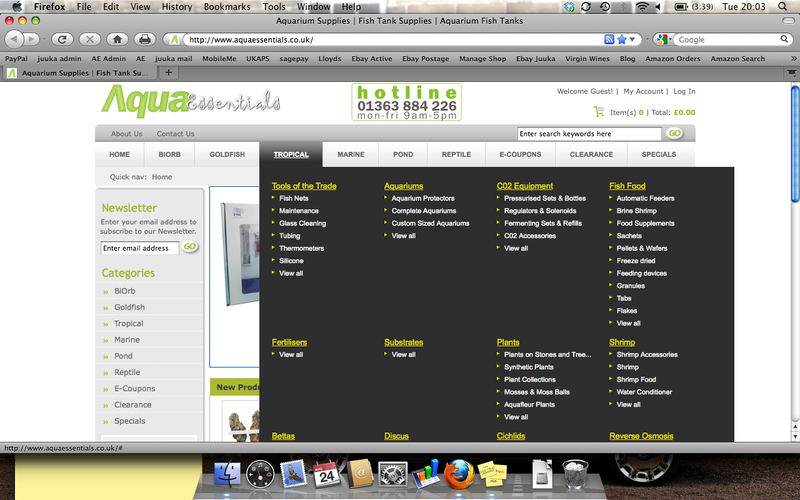 We’re delighted to announce that you can now browse quicker on Aqua Essentials. We’ve listened to the feedback so far and are implementing changes. Simply hover over any of the categories at the top of the page and a drop down will show allowing you to find the product/s you need quicker. Enjoy and happy (quicker) browsing. We’ve introduced a wider range of E-Coupons so that we can fulfil a wider range of expectations. E Coupons are an excellent idea as a present for a birthday or simply a gift. They are transferrable via email or via our website, so if you ever forget to send a present, you can send one at a click of a button. Starting at £5 going up to £100. Crypts are truly lovely aquarium plants. They are undemanding, require little maintenance and are ‘easy on the eye’. What’s more is they come in many different styles and this particular one is a cracker. This particular crypt is brown and one of the reasons it is so popular in the planted aquarium. It provides a refreshing change to most plants which are green and looks particularly nice if planted in groups around stones. Other plants are available and can be found here.